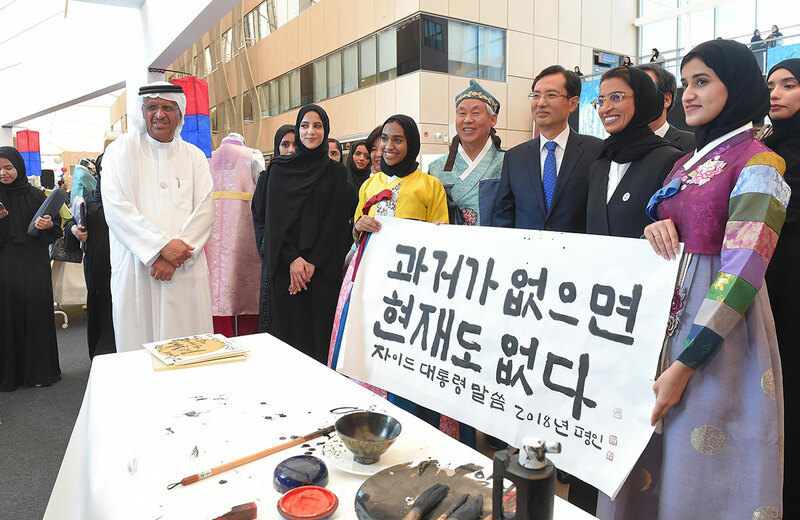 Her Excellency Noura bint Mohammed Al Kaabi, Minister of Culture and Knowledge Development, President of Zayed University, had recently inaugurated together with His Excellency Park Kang-ho, Ambassador of the Republic of Korea, the 'Day of Jeonbuk' festival, which falls part of the Korea Festival 2018 in the UAE. The day showcased the beauty of the Korean province, Jeonbuk, with its spectacular dances, music, food, and cultural activities. This year's Korea Festival 2018 will feature performances and exhibitions in a span-of-one-month across the country, held in commemoration of the 100th anniversary of the birth of Sheikh Zayed bin Sultan Al Nahyan, the founding father of the UAE. Zayed University hosted the 'Day of Jeonbuk' of the Korea Festival 2018, which was held at their Abu Dhabi premises in the presence of Prof. Reyadh AlMehaideb, Vice-President of Zayed University, Mrs. Cha Kyeongeun, Spouse of the Ambassador. Mr. Lee Kangoh, Director General of International Relation, Jeollabukdo Province, Mr. Lee Junho, Director of the Korean Culture Center, Embassy of the Republic of Korea, and a number of the faculty members from the university and hundreds of female students. Several activities took place during the event, traditional music and dance by Namwon Music Orchestra, which was established in 1921 and it is well-known for its longest history in Korea and the highest quality of the Korean traditional music. The band performed six different featured performances that wished perpetual prosperity and peace in the UAE. 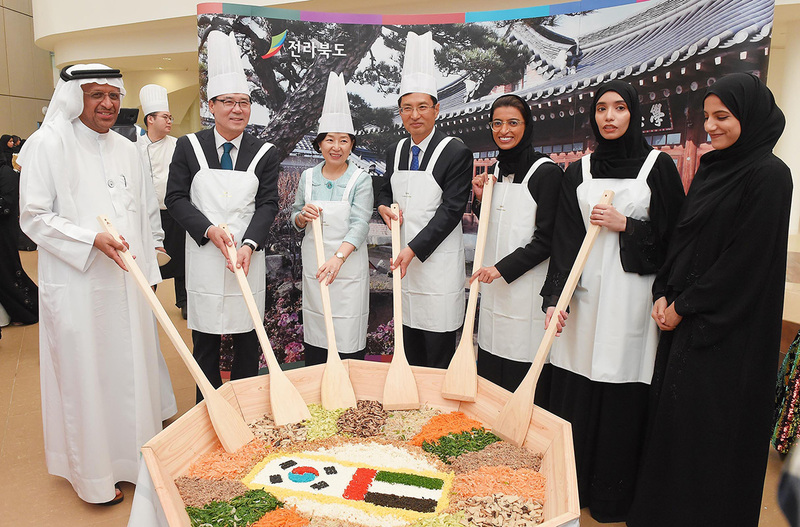 Attendees rejoiced the wonderful demonstration offered by their excellencies Noura bint Mohammed Al Kaabi and Park Kang-ho of preparing the Bibimbap, famous Korean Cuisine. Bibimbap word, literally mean "mixed rice." served with sautéed and seasoned vegetables, and gochujang (chili pepper paste), and soy sauce, or doenjang (a fermented soybean paste). 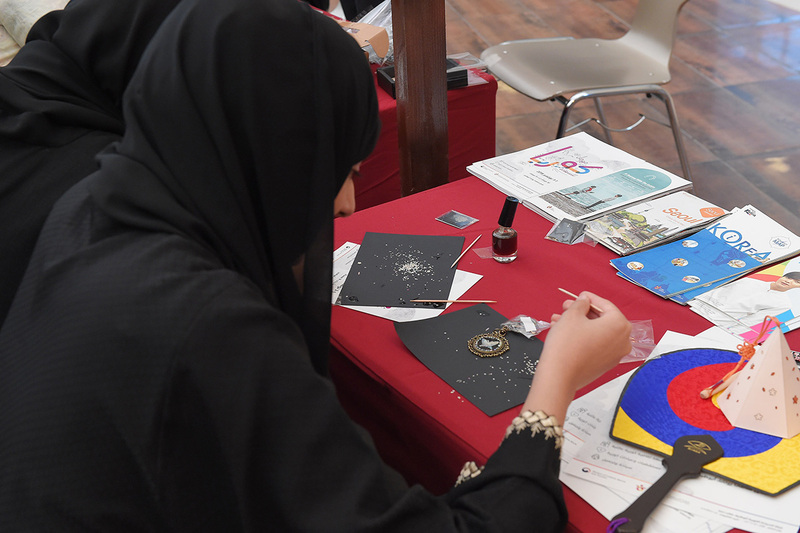 Over 100 female students, part of the Zayed University Korean Cultural Club, which was founded back in 2009, participated in the Korea Festival 2018. They presented unique craftsmanship talents, presented fashionable Korean outfits, and arts related to the Korean culture, all at seven arranged booths at the Students Promenade. Students showcased unique calligraphy abilities, served at traditional cooking stations, drew Korean cartoon characters, and demonstrated a high-capability of communicating with Korean representatives and guests.